When friends move across the country and leave their stuff at your house, it is a nice thing to send it to them. It is sort of unreasonable to delay the shipping of said thing(s) because of a complex plot to actualize an inside joke in a bizarre, cross-referential way. But if it’s even occurred to you to do something like that, you probably don’t care about being reasonable. Jared & I played Mary & Joseph in a Christmas thingy at church a while back. Curtis played Jesus in an Easter thing a while later. Obviously it follows that we are his fake parents. So we sent him the only reasonable thing fake parents send fake children. Jared models hat for fake son immediately after blocking. “Pattern” review: I kinda sorta used this pattern. 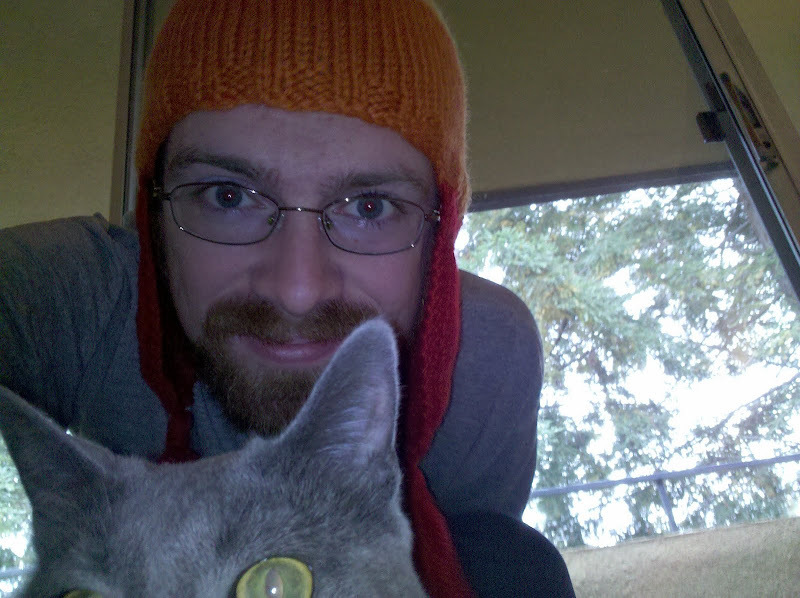 There are a gazillion free Jayne hat patterns on ravelry, probably because none of them look right, probably because they’re all trying to look exactly like the one on the show, which itself doesn’t really look right. So I used this pattern for the cast on number, then more or less used what I know to make a hat that will actually fit a human head. (Unlike the original, it’s not 2 inches too tall, the earflaps hang flat and are actually over the ears, etc.) And of course I have completely lost the ability to resist attaching freakishly huge pom-poms to everything. Yarn review: Galway chunky! It’s wool. It comes from sheep. Very basic stuff, but good quality. Turns out interplanetary post takes for freaking ever. But I don’t think the package was accompanied by a not-quite-dead body, which is to everyone’s advantage. Fjord and Yoshimi: pretty cunning, doncha think? Great picture of the hubba!